At Hyegraph we do Wedding Invitaitons, Invitations for parties and events, holiday cards and shower invitations too. No matter what kind of invitation or announcement we design with our clients they love our Digital Calligraphy for addressing their envelopes. This is a great time saver and allows them to concentrate on other aspects of their party planning. Once our client brings over or send us their invitation envelopes we can have their addressed envelopes ready for them to pick up even on the next day. Our Calligraphy for addressing is beautiful with script fonts, block fonts, colored ink, black ink or custom ink. We also create beautiful place card calligraphy personalized with guest names or colorful icons that incorporate the theme of your wedding or event. In addition to place cards, our customers also like us to print their menu/wedding menu cards for them. We add their monogram or use the images they would like to emphasize as well as their menu items for the lunch or dinner they are having. So we are a one stop stationery design studio. We work with our over 200 albums and over 60 different printing companies; we work with companies across the nation as well as oversees. Prices for our Calligraphy for Envelope Addressing is $1/envelope. 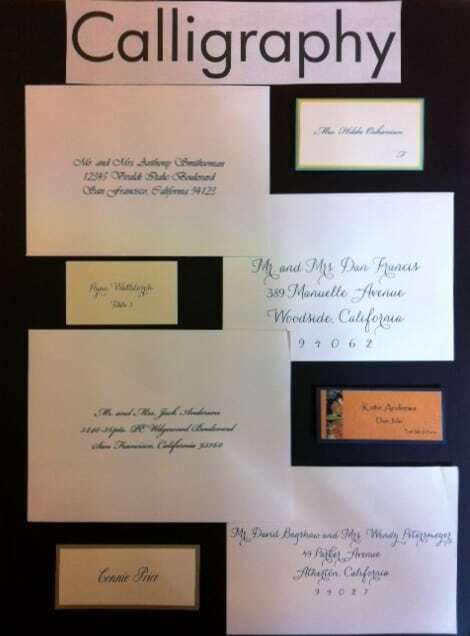 Prices for place card calligraphy is also $1/per place card. Our calligraphy for Menu Cards is $1.75 per menu card. 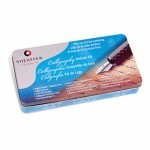 For colored ink for addressing and calligraphy for place cards and menus is $.25 cents more. Please call for questions regarding placing order at 415-626-0461. To see more Calligraphy font styles and complete ordering instructions see our Calligraphy Page. For ordering our beautiful Wedding and Party Invitations & Announcements online, please see our Shop Online site! 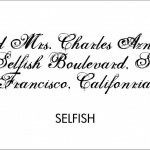 If you’re interested in having Hyegraph do your envelope addressing with elegant calligraphy please call, email or stop by our San Francisco Store located at 3 Embarcadero Center in the Financial District.